As you may know, for the past year we have been sponsoring Alzheimer’s Research UK. Our relationship started when they came to us to book a voice over session, and we realised this was an opportunity to lend our talents to help a cause that is very close to our hearts. A year ago, at the age of 64, my mum died of a rare form of Alzheimer’s Disease. Diagnosed at 54, it brought an end to a 10 year battle with the disease which slowly picked my mum apart until she could fight no longer. She fought with humour and braveness but the disease finally had the last laugh, leaving only grief and sadness for those that knew her. Unfortunately my mum is not the only person to suffer with the disease and we are not the only family to experience what it’s like to lose someone in this way. So when Alzheimer’s Research UK came to us to book a session it is with great pride that the company decided to take it further and declare support to the charity. As well as working with them in the studio, we have been fundraising to raise much needed cash and much needed awareness. Alzheimer’s Research UK are working hard to create a world free from the fear, harm and heartbreak of dementia, and at the moment the battle against Alzheimer’s Disease is massively underfunded. Our next fundraising event will see “Team Clearcut Sound” cycling from London to Brighton, on September 17th. Hopefully the picture on the left now makes sense. Look past the ridiculous hair (circa 2009!) 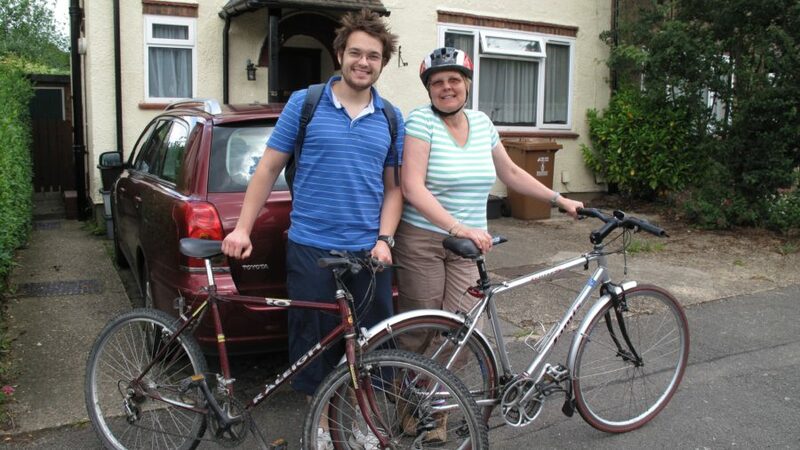 and it’s a picture of a son and his mum, who was suffering with the disease at the time, about to embark on a cycle ride. My mum loved to cycle which makes this ride even more poignant. First we will don our lycra. Then we will pedal are socks off all the way from Clapham to the Brighton seafront. If either of these things impresses you and you can find it in your heart to sponsor us then we would be extremely grateful.